Parent Company Atlantic Bridge Aviation (ABA) was formed in 1988 by individuals with many years of experience in aviation. ABA is involved in commercial and business aviation consultancy. Operating on a global basis, ABA has been intrumental in airline start-ups, airport development and offers a wide range of services in aviation consultancy. World Executive Airways - on demand charter throughout the United Kingdom and Northern Ireland, Eastern and Western Europe, Mediterranean and North Africa. 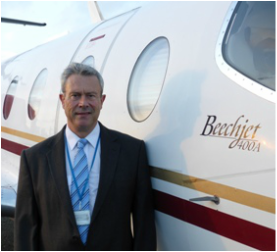 2017 marked our 20th year of operating scheduled and charter flights from Lydd International Airport. From our genesis as Sky-Trek Airlines in 1997 (renamed LyddAir in 2002) we have come a long way. We now have three types in our fleet comprising pistons, turbo-prop and jet aircraft. This gives us multi-role flexibility and allows us to serve you better with an aircraft tailored for your specific travel needs. We have the added capabilities of medical evacuation, organ transport, and the carriage of specialised cargo. We also have an on-demand charter franchise operating under the divisional name of “World Executive Airways,” a title befitting our expanding horizons. Ask about our block booking scheme to save on charter and our innovative "Air share" fractional programme. Whatever your aviation needs, my team and I stand ready to provide you with our best attention at all times.